With an assault of impiety, the film makes Christmastime in America seem an impossible place to be if you live at the margins. The way that message is conveyed throughout the movie, however, is more fluid than solid. After his introductory monologue, Willie stumbles into the alley behind the bar where, with the Chopin nocturne still lilting, he upchucks loudly into the snow. It’s a beautiful shot, retching Santa and all, that ends with the postcard appearance of the movie title in red lettering. Such an improvement! The gleeful desecration of all that is held dear by the hated and resented outgroup. So Jews subverted Christmas but their motives were pure and idealistic. [Somehow Adam Chandler’s pure idealism fails to come through in his comments on Bad Santa.] But such an account ignores the Jewish role in conceptualizing America as a proposition nation—a major topic of The Culture of Critique. The Jewish stress on cultural pluralism (which has now morphed into multiculturalism) was an explicit rejection of the ethnocultural strand of American identity, an important part of which was Christianity. (Indeed, until the recent wave of immigration resulting from the 1965 law, Jews constituting 2–3 percent of the population, were the only identifiable American group that was not Christian.) Jews were central to building a wall between religion and the public square which has resulted in the “war on Christmas” that we still see raging. Jews were also central to changing U.S. immigration policy to be open to all the peoples of the world, again with an ideology that America is merely a set of abstract principles and has no ethnic or cultural core; therefore it should be open to all peoples and these peoples should be able to retain their own culture as part of the American mosaic. 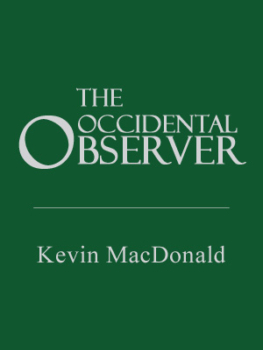 https://www.theoccidentalobserver.net/wp-content/uploads/2018/06/featured-image-placeholder-solid-kevin-macdonald-e1529399935906.jpg 350 263 Kevin MacDonald https://www.theoccidentalobserver.net/wp-content/uploads/2018/06/TOO-Full-Logo-660x156-1.png Kevin MacDonald2018-12-27 00:51:482019-01-07 19:19:30"Bad Santa" and Eli Plaut's "A Kosher Christmas"
01 Several months ago I read a plausible historical account by a German Jewish female scholar, still, or again living near Mannheim, recounting conditions in Germany preceding the holocaust. 02 Hers was primarily a social history – what concerned and motivated her community at that time. 03 What stood out, for me, was their exceedingly well organized networking: according to her, all of pre-War Germany was covered SEAMLESSLY by Rabbinic authorities in their delineated jurisdictions. 04 Add to this their touting of their general communities’ and congregations’ control, at least influence, over their individual members, of whatever sect, and one is obliged to wonder why that was not applied long before to avert the disaster. Before heavily, even determinatively contributing to WW I, then sabotaging Germany in all ways possible. 05 Not only have the hoodlums among them not learned, but they have increased their target from Wilhelmian Germany, via Russia, to the entire PRESENT Christendom and its appurtenances. 06 It’s as if one of their own many Goebbels enquired of them noddingly, whether they are in favor of ” total War “. 07 We got, and will get wailing air raid sirens, they wail anti-Semitism. Then expend, collectively, billions of our taxes fighting it. Didn’t Jews tried to kill Jesus from the very beginning? Herod? The immense differences between Jewish and European holidays reflect the immense differences between Jews and European/European-descended peoples. The Tablet article by Chandler made my blood boil, as a review of Bacques’ Crimes and Mercies first did years ago. The hideously hateful essence and behavior of Jews can drive a person to thoughts of violence. Years ago, when it was relatively new, I caught Bad Santa airing on television, thinking it might be a decent comedy. Even as an unsophisticated man in my early twenties, and an atheist, who enjoyed lowbrow comedy like South Park, this movie was so devoid of comedy or entertainment value, and frankly disgusting, that I turned it off well before it was over. One can’t help but question the oft-touted claim that Jews possess an above-average IQ, whether we’re talking about the film’s Jewish creators or its intended audience. A “classic”? Do Jews fondly remember “classic” bowel movements, too?